Delaney Bianca Morris graduated in 2016 from Columbia’s Live and Performing Arts Management program and is working as a Creative Production Assistant at Macy’s Parade & Entertainment Group. If you’ve never seen the iconic Macy’s Parade, put it on your bucket list! It’s the world’s largest parade, featuring balloons, floats, marching bands, live music, and performances. More than 8,000 people participate, while 3.5 million people line the streets along the parade route to see it in person, and another 50+ million watch it on television. The parade has been an annual tradition since 1924, and Delaney is part of the logistics that help make it all happen! 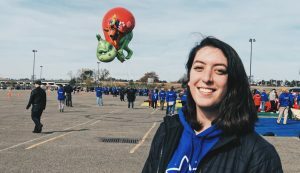 We asked Delaney a few questions about her experience at Columbia, internships, and what she loves about her position with Macy’s Parade and Entertainment Group. Read on and prepare to be amazed! How did an internship or on-campus job help prepare you for your first job after graduation? My time at Columbia was extremely impactful on how my career has played out so far. It actually began during Welcome Week my freshman year, when I was invited to join the school’s Percussion Ensemble. That first semester is when we performed in Pilsen for ElevArte Community Studio’s annual Muertos de la Risa procession. 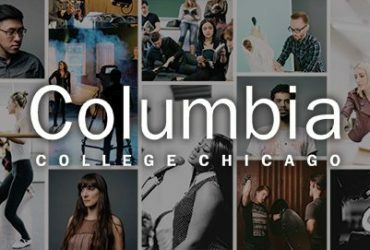 The following year we were asked back again, this time working as teaching artists within one of the neighborhood elementary schools through a partnership with Columbia’s Center for Community Arts Partnership (CCAP). In my junior year, I worked with ElevArte Community Studio, where I became the Parade Manager for the Muertos de la Risa celebration. From there, I ended up working with ElevArte and CCAP on many different events. This all facilitated many new networking opportunities, specifically within the parade world, and I quickly became known as the parade lady within my friend group. How did you find your position at Macy’s? During my junior year at Columbia I became the first producer of Columbia’s contingent in the Arts in the Dark Parade (formerly known as the Halloween Gathering). At this time, I was meeting with people all over the college to work on representing as many folks as possible within the parade. One of those people was Andrew Whatley, now the Senior Director of New Student Enrollment Services. We began talking about parades in general and he mentioned that his cousin was actually the Creative Director of the Macy’s Thanksgiving Day Parade. So that summer, because of the introduction he made for me, I went to NYC and met Wesley for a meeting to discuss a potential internship opportunity. However, at the time nothing panned out because I was set for one more year in Chicago and an internship on the East Coast was just not feasible. After graduation, in May 2016, I was on the job hunt. I was working as the Assistant Producer on the second Halloween Gathering parade in Chicago when I saw that Macy’s was hiring a production assistant. I e-mailed Wesley and let him know that I was applying, had the interview, and they actually offered me a different role as the Creative Production Assistant for the Thanksgiving season. After my first season at Macy’s came to a close, I actually then moved out to Washington State to work as the Cultural Arts Coordinator at the City of Everett, Washington. This position was also only seasonal so I was able to move back to NYC for a second season on the Creative Team at Macy’s, which is where I am currently. I love so many things about my job, but probably the coolest thing is the fact that I help to kick off the holiday season for 56+ million people around the nation. This job is like nothing you would ever imagine either. My work consists of casting balloon-heads and stilt walkers, deciding songs for the opening number, working with talent such as the Muppets, coordinating with all marching bands and performance groups, determining the parade lineup, writing scripts for different events, coordinating music delivery, working with NBC on the telecast rundown, getting to meet and work with the real Santa Claus and so much more! What advice do you have for senior students? My advice for senior students is to network, network, network. Every single position I have ever held has come from knowing someone. Be passionate about your work, but more importantly be grateful toward the people who help to elevate you in your career. Thank you, Delaney! We wish you all the best and look forward to this year’s parade and what comes next for you! Students: if you need help with your resume, portfolio/website, or assistance in your job or internship search, please make an appointment with your Internship and Career Advisor in the Career Center.